Please stop by for a tour of Household Goods. People always tell us “you have to see it to believe it” – and this is a special opportunity for you to see for yourself all the ways your furniture and household items are essential to making a home for individuals and families in need. 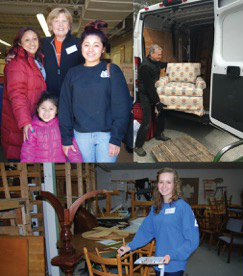 Learn how volunteers sort, process and display the donated items received, and understand the way Household Goods provides clients a dignified and respectful “shopping” experience. Meet some of our volunteers, and, if you have time, stop in for a tour! We’ll be accepting donations, too. See our Donation Guidelines for items we always need.